The InSitu Ball-Lock Sensors are a series of standard designed and manufactured sensors available off-the-shelf for use with any of the Ball Lock sensors manufactured by Dayton Progress, Future, Lane Punch, Porter Precision Products, and Danly. Using these sensors saves considerable time and money when sensoring a punch is warranted. Using the signatureACE® with InSitu software you can monitor punch wear directly and replace the punch before it wears completely. Simply replace the punch...the load cell stays in the die-shoe where it is protected. SAMview diagnostic software provides the means to check load cell electrical characteristics without removing the cell from the tool. Highly standardized Ball-Lock products are used in high volume applications where dies are large and cannot be easily removed for maintenance. The ball lock concept allows for the convenient replacement of worn punches and matrixes without removing the die from the press, saving many hours of downtime. Punches and matrixes are completely interchangeable, allowing quick and easy replacement. The Dayton True Position® Ball Lock retainers are performance proven, having been accepted by over a dozen automobile manufacturers around the world as their standard retainer. True Position retainers are CAD/CAM compatible-Simplifies your die design process. No custom designed sensors needed nor modification of tooling (except die shoe) to accept sensors. Each sensor is calibrated so sensors can be replaced using only new calibration factors. Sensor components are in sealed cavity to protect from abuse or chemical attack. 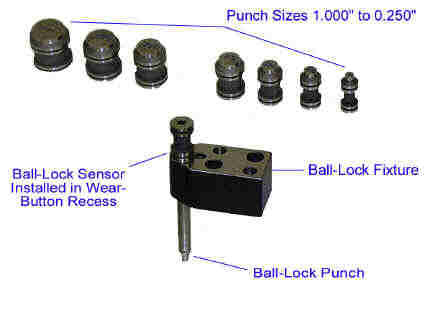 Sensor is designed to fit the standard wear-button cavity common to all ball-lock sensors and thus it is interchangeable among different licensed manufacturers of ball-lock punches and fixtures. Buying standard off the shelf sensors means no waiting for new sensors. Volume manufacturing of standard sensors means that these sensors are half the price of typical custom sensors.